In his career as a chemical engineer, Martin Stratmann attracted considerable attention when one of his research projects paved the way for the development of self-healing coatings able to protect steel and other metals from rust. 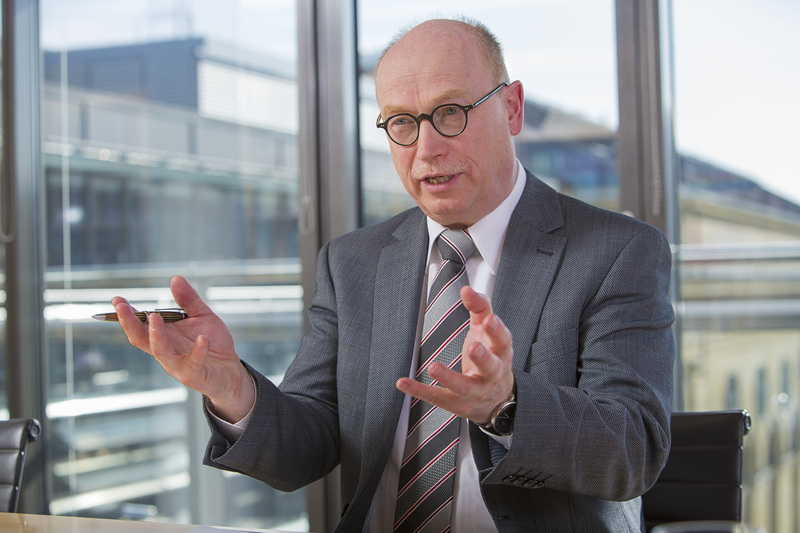 Having been recently elected as the President of Max Planck Society, the most successful Germany’s research organization with no fewer than 18 Nobel laureates, Dr. Stratmann tries to inspire younger generations to get involved with research. Martin Stratmann talked with Amalia Drosou about his research activity, the emerging need for establishing solid and bidirectional interconnections between research and industry in Europe and the research human resources in Greece as including the possibility of extending Max-Planck’s research facilities in Greece. A method within the framework of your research activities made possible the development of synthetic coatings which are able to both protect steels and other metals from rust and enables metals to heal themselves. Could you please mention 1-2 cases where this method has been applied up today? First of all, our research is based on a very novel technology implemented by an equally novel instrument that allows the measurement of electrochemical properties at a metal polymer interface. Based on this technique, we have got a deep understanding about what processes give rise to a de-adhesion of organic coatings from metallic substrates like steal and many others. There are many improvements based on that knowledge. First, we came up with these very specific molecules which have been placed at the interface between the substrate and the coating and have two ends (i.e. one attached to the metal, while the other one to the polymer). This method became a commercial product and has been used on many aluminum rims. Its beauty lies in the fact that it provides invisibly thin corrosion protection and adhesion promotion. The second process that has not been commercialized yet relates to the search for coatings which may have repair properties. It is a kind of active protection system. These coatings have the ability to detect the defect and release certain molecules which move to the interface and ignite a reparation process. Its increased complexity is the main reason why this has not been in the market yet. Nevertheless we have really achieved considerable progress and in fact active protection of metals seems to be possible. The research activity of Max-Planck ranges on a wide and interdisciplinary spectrum including both theoretical and experimental sciences. What do young researchers expect when they join the research organization? I believe that young people join our community because they want to realize their own research ideas. What they really strive to do, is to fulfill their own visions as young scientists. At Max-Planck they expect to find an ideal environment to develop their talents. And we do our best to fulfill these expectations. How would you rate the connections between research and industry within the European borders? What is the role of research in overcoming the current financial crisis and recession? I think there is strong interaction between science on the one side and industry on the other. Therefore politicians should place an appropriate value on science in all countries. Today this is not the case. There are countries like Germany, Switzerland and many others where science is highly valued and supported which makes them competitive players in research worldwide, while in other countries, science does not receive the same support and is therefore less developed. This is the reason why the ERC Grants are so unequally distributed in Europe. In any case the problems in Europe today are less of a financial nature, but more of a structural one. To overcome these problems it is essential to initiate more industrial activities especially in the weakest EU countries. The key elements to achieve this are knowledge, well trained and motivated people – people with outstanding capabilities, who can push industries. In my estimation it will take a long time to build up and develop industrial infrastructure which can compete, deal and interact with really good scientists. This is why there is still a long way to go until these countries will show signs of growth. What about Greece? What is your opinion about Greek researchers abroad and the research produced in Greece? We have only a few research collaborations with Greek scientists. Nevertheless, a large number of Greek scientists come to our laboratories and stay with us as guest scientists or to pursue their PhD. I think that the education system in Greece is quite good. The students coming to us are highly educated. Unfortunately, today they have hardly any prospects in their own country and therefore have to look for a job elsewhere. These days, Greek science is suffering from a lack of an adequate financial structure. Are you satisfied with the amount of young people who get involved with research? How important is it for young researchers to take risks? Research has always been a risky business. One starts to investigate something which is totally unknown without knowing the result beforehand. Apart from this, it is essential for a good scientist to know how to deal with and how to minimize risks. Science is a kind of self-fulfillment of your own capabilities, and this is why many young scientists love research and are willing to take risks. In Germany research is very much linked to a career in industry – we are very lucky that this is the case. Studying physics, chemistry, informatics, etc. is a scientific experience but it also opens opportunities for an industrial career in the future. Many young students regard working for Max-Planck as an inspiring phase of their lives, and they appreciate that they can move on to industry afterwards. Would you ever examine the possibility of extending the Max Planck Society even further, by founding a branch in Greece? Given the fact that there are some Max Planck Institutes in Europe, I think that is a possibility. But in any case certain boundary conditions need to be fulfilled: For instance, we have to look out for potential institute directors who are outstanding in science. The research topic must have so much potential that it can carry an institute for the next decades. Last but not least, we need basic funding from the government. For example, our latest institute foundation outside Germany is funded by the Luxembourg government. Of course, the resources are substantial but in return such an institute will be a “Lighthouse” in science for the specific country. Do you believe in role-models? Anyone embarking on a scientific career must learn how to cope with setbacks and dead ends. Not every experiment leads to success at the first time. Scientific role models help to get through such frustrating phases – successful scientists had the same experience and one can learn from them. Female role models are very important. After all, we want to attract more women to science and encourage them to stay in the field of science and fulfil their ambitions – no matter how hard it is. This remains difficult however, if the majority of the role models in physics and chemistry are male.